Award-winning journalist Nita Wiggins worked twenty-one years in broadcast journalism, in both the sports and news realms. Since 2009, she has been a journalism trainer at the reputed L’Ecole Supérieure de Journalisme de Paris (Paris, France), where she teaches American Principles and Practices of Journalism (and Sports Journalism), the masters-level curriculum she created. 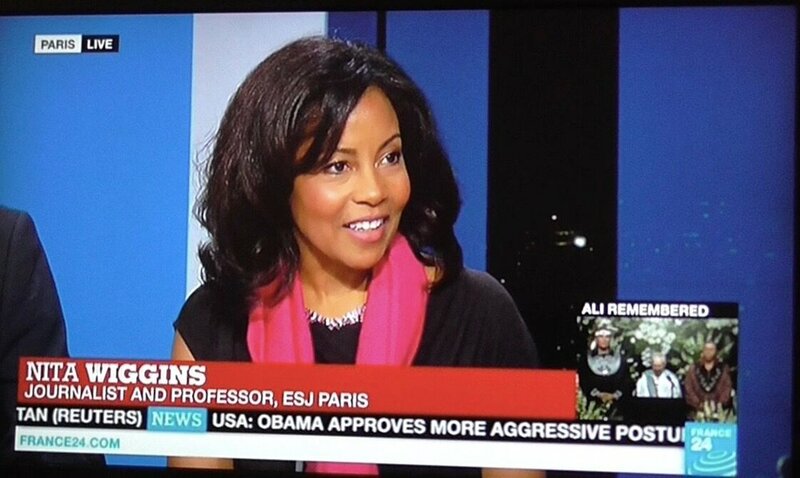 In Paris, she has appeared on France 24’s television broadcasts, dissecting the results of the 2016 presidential election, the debate performances of the two candidates, and the impact of the life of Muhammad Ali after his death in June 2016. She has been interviewed by France’s RMC and RFI radio outlets to discuss topics as diverse as Pres. Donald Trump’s visit to France in July 2017 and her assessment of African American life 50 years after Dr. Martin Luther King Jr.’s Nobel Peace Prize. Before becoming an educator and social commentator, Wiggins set television firsts. She was the first female African American sports journalist hired to the position on a full-time basis in cities such as Seattle, Washington; Memphis, Tennessee; and Augusta, Georgia. In those jobs, she gained the confidence of newsmakers and athletes alike and was able to secure exclusive interviews. Some of those one-on-one interviews include Muhammad Ali, Roger Staubach, Tony Dorsett, Jerry Jones, Michael Jordan, Cindy Brinker-Simmons, John Daly and Jackie Joyner-Kersee. Wiggins also interviewed Rosa Parks and former U.S. President Jimmy Carter. While a sports reporter in Dallas, Wiggins contributed to KDFW TV's winning the 2001 regional Emmy for special events coverage of the Cotton Bowl Classic football game. In addition to her professional experiences, Wiggins initiated and helped fund a study-abroad program at her alma mater, Augusta University, in Augusta, Georgia. The school began the cultural and educational exchange with the West African country of Senegal, in 2007. Also at Augusta University, Wiggins established in 1995 the Walter Wiggins-James Lott Communications Scholarship. She provided educational funding for recipients from 1995 to 2008. In 1989, she received the Michele Clark Fellowship, a national award given by the prestigious Radio and Television News Directors Foundation. In 1985 and again in 1986, Wiggins was named to Who’s Who Among Students in American Universities and Colleges. Wiggins holds a B.A. from Augusta University and a European Master I, Level II, from L’Ecole Supérieure de Journalisme de Paris.
" It had to be difficult to be a woman in sports reporting at the time, but Nita became a reporter on the Dallas Cowboys beat. Like athletes, she beats the odds! " " I just had to take the time to let you know that your work is being noticed. Thank you so much for following your passion for sports and setting a great example for all of us viewers who love to watch. " " Without hesitation, I allowed Nita into my home to do an interview. I always respected her professionalism, and she did a really great job! " " I really appreciate the stories of brave women who managed to change their lives. That shows us that we can fulfill our dreams, not being afraid to have big ones. "